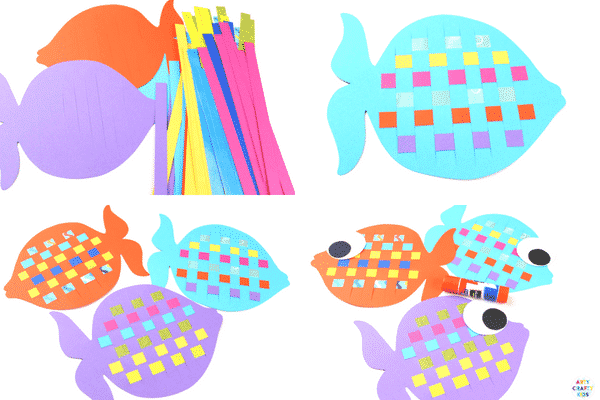 This delightful Easy Woven Fish Craft is perfect for little hands. The weaving process is great for building on fine motor skills and the results are rather pretty too! 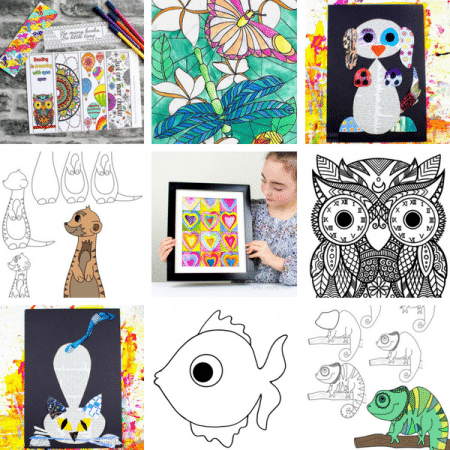 A tactile craft that can be personalised and adapted to suit varying abilities. 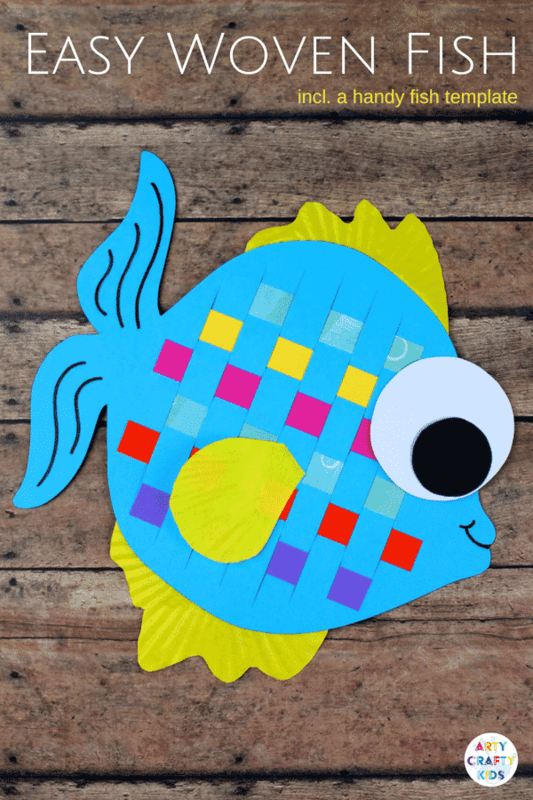 Very young children may prefer to simply cut and stick paper scales onto their fish. 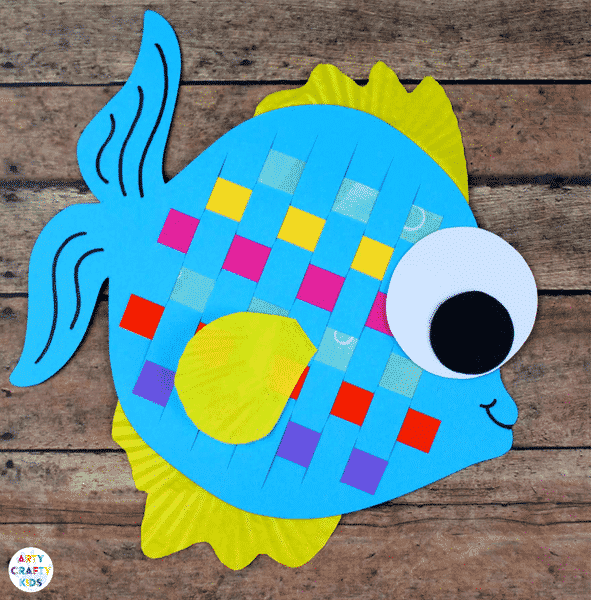 Some could also paint their fish as we have done so with a previous butterfly craft, which looks great against the paper weave and could add another dynamic to the fish – this could work well paired with the book Rainbow Fish. 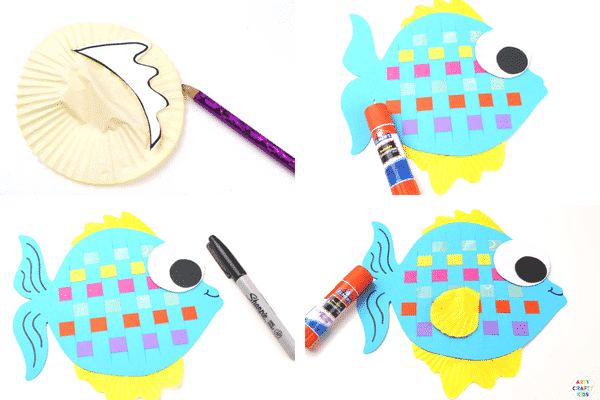 This colourful addition works perfectly within the home or classroom – could you imagine an under the sea themed bulletin board filled with these fanciful fish? 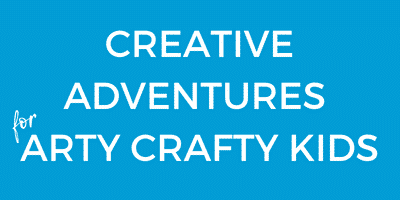 and with our handy template (supplied towards the end of this post), the craft couldn’t be easier! While the strips can be cut by hand, a paper cutter is much easier and less time-consuming! Step 1. Download the template and print. Step 2. Cut the fins off the fish and trace the body onto coloured cardstock and cut out. Step 3. Fold the fish in half and cut strips into the paper. Leave about an inch of paper all around the sides so that the paper does not tear while being weaved. Step 5. Cut strips of coloured cardstock about half an inch wide. Step 6. Weave the strips of paper in and out of the fish. Step 7. Cut the excess paper off the sides and glue to prevent the strips from moving. Step 8. 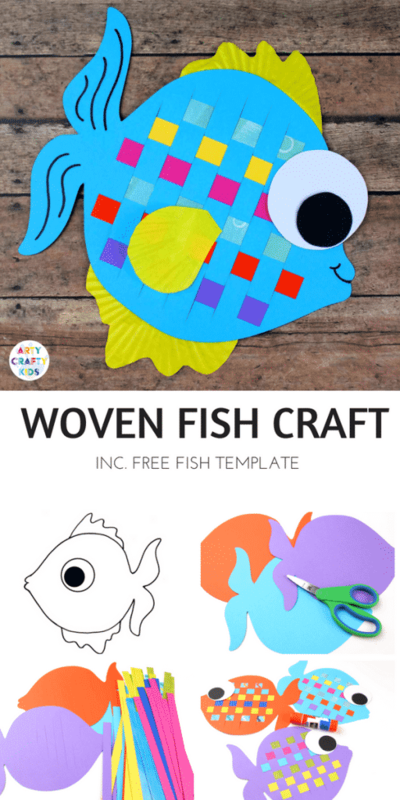 Cut out the big circular eye from the template and transfer it onto the woven fish. Step 9. Trace the fins you previously cut off the template onto the coloured cupcake liners and cut out. Step 10. Glue the fins onto the back of the fish. Step 11. Use a black marker to add a smile and detail to the large back fin. And ta-da, the Easy Woven Fish Craft is complete! 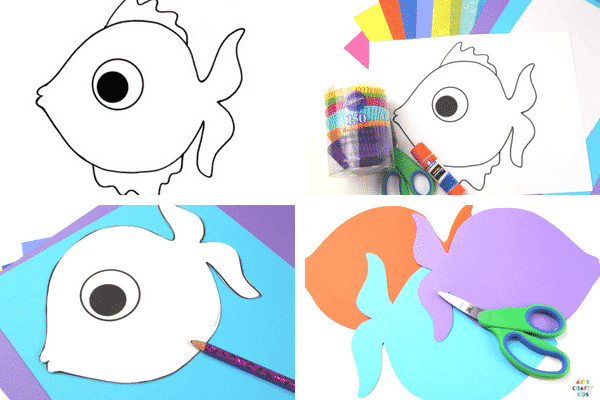 For more under the sea themed crafts, you may also enjoy our popular Paper Plate Jellyfish Craft, our awesome round-up of Under the Sea crafts and (my personal favourite) our Bubble Wrap Puffy Octopus!